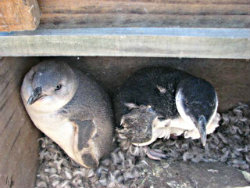 Skeinz is the proud to have created the Skeinz Penguin Rescue Fund. 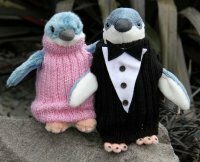 After the Rena oil spill disaster in Tauranga in 2011, Skeinz co-ordinated an effort to have wool jumpers knitted for the penguins effected by the disaster. The response was so overwhelming that thousands of jumpers were received. Skeinz created the Fund & it’s mascots to raise funds not only for the Penguins effected during the spill, but all Little Blue Penguins who’s habitats are under threat – especially here in Hawkes Bay. 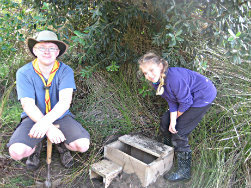 So far thousands of dollars have been distributed to NZ Forest & Bird for the Rena clean up & Cape Sanctuary to build LBP burrow boxes. We are now working with the National Aquarium of New Zealand in helping with a LBP education programme. The start of this is this sign on the Napier walk way in Ahuriri. LB penguins nest all along the urban foreshore in Napier & this sign is the first in a larger plan to help educate urban dwellers of the wildlife living right under their noses. This area is a leash on dog walking zone and it's important as dog attacks are one of the leading causes of injury and harm to the urban LBP flock. Make sure you say hello to the penguin mascots in store, purchase a mascot, select your own jumper & help the NZ Little Blue Penguin.